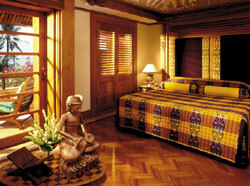 For centuries past, Bali has attracted the most talented artisans and craftsmen from across the archipelago. Seduced by generous offers of royal patronage, a traditionof the finest arts, is the legacy that lives on in Nusa Dua Beach Hotel & Spa's Palace Club. On arrival guests are welcomed in the comfort of the Palace Lounge. A personal 24 hours butler will then explain the special services available before settling guests into their palace room. Within the hotel grounds Nusa Dua Spa offers Palace Club guests a sublime range of treatments designed to soothe body and soul. Guests can also take advantage of Nusa Dua Spa's amenities which include a fully equipped gymnasium, lap pool, climbing wall, squash and tennis courts as well as a spa salon, Spa Caf� and Spa Essentials shop which stocks a luxurious range of local spa products.